Today I want to share this project I made with lots of layers! 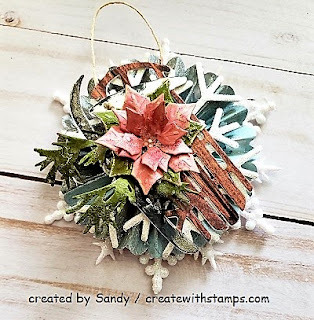 I used a snowflake as the base and than created a rosette using the fan die from Fun Stampers Journey. I than die-cut a snowflake using glittered fun foam that you can pick up in your local craft store. I also die-cut the sled from a die I had in my stash, once in mirror c/s and than in wood colored c/s. from Cozy Prints. I created small poinsettia using Spellbinders Die and added white pigment ink to the edges of poinsettia and chunky glitter to the center. You can use as an ornament or add to a gift as an embellishment. Give as a gift and create a box, simply handmade from the heart! 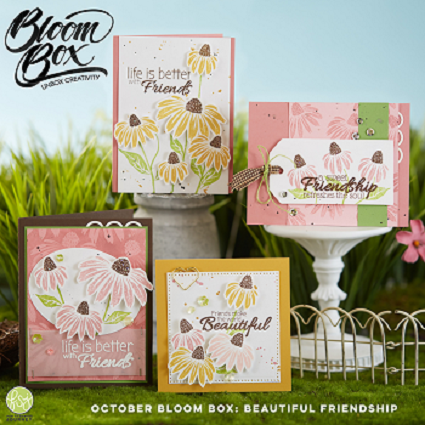 I wanted to share this month's Bloom Box...Life is better with Friends and what a beautiful floral image. Is it a Daisy ,Sunflower or a Cone Flower, how many different species fit into this category? Here is a close-up of the stamp set...don't you just love the fonts on the sentiments, I know I do! Some changes to be aware of: The 6 month subscription is not available due to changes I shared in previous post, however you may purchase this ala carte! If you would like to view the complete supply list click here and if you would like to purchase this kit Simply click here to purchase yours. The subscription kits have been shipped so the quantity is limited so be aware that it is while supplies last! and Spellbinders are partnering up. What does this mean exactly? 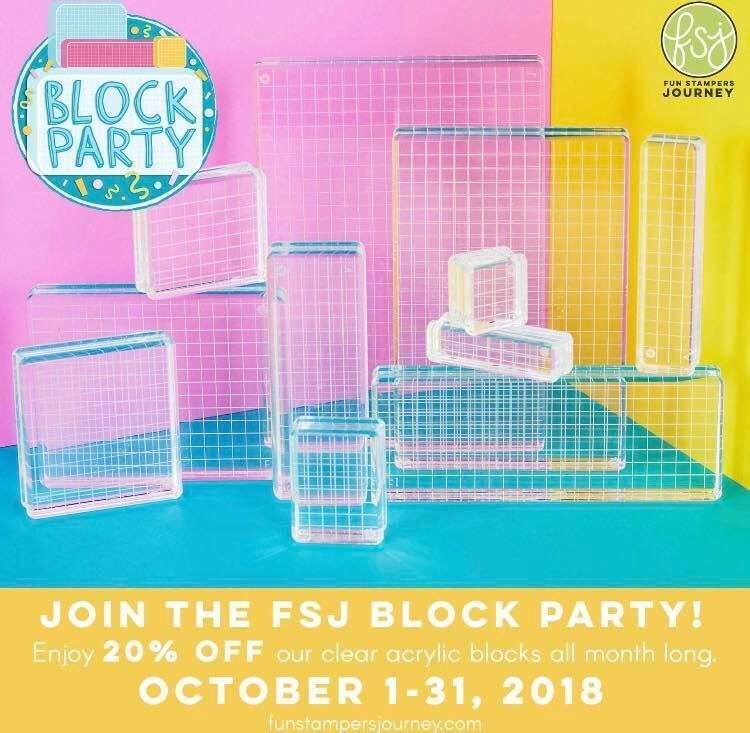 Fun Stampers Journey will no longer be a direct sales company. We will be doing business as usual in the month of October and than Nov. 1 this transition will take place. I will no longer be considered an independent coach nor will I have an e-commerce store. 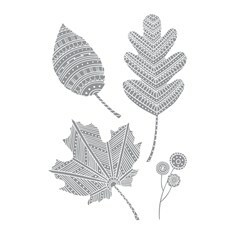 I however embrace this change because I will be doing what I love sharing my creations with paper, ink and stamps. I hope to bring you up-dated information as I transition into the new business model. 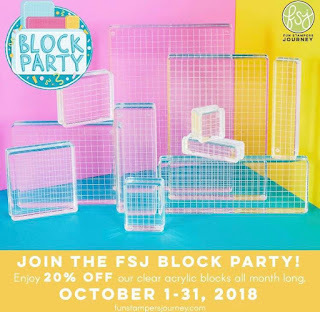 Stock up on these beautifully etched clear blocks at a 20% discount! You can still shop by clicking on the cart for any of your favorite products until further notice. Well, I will say the weather is changing with it in the 40's this morning, I'm thinking is it too soon to put the heat on? I don't know but it certainly is helping me to get in the holiday crafting mood, which brings to my card share today. With Christmas in mind I created a gift and a card all in one. On the left side Santa greets you with a Ho Ho Ho and in the middle are three pockets one for each child, all I have to do is add their names to the pocket, which will hold a gift card for each one. On the right side is my Christmas Greeting which was created with sentiment stamps from Fun Stampers Journey and the Merry was a die I purchased from Elizabeth Crafts when I went to the Expo this summer. I kept it simple looking since they are young. The printed paper I picked up last year from Michael's, it was their Christmas Hot Buy Paper Pads. Everything else is Fun Stampers Journey with the exception of the Merry Die. I hope you enjoyed today's project and gives you some inspiration for your own holiday crafting. 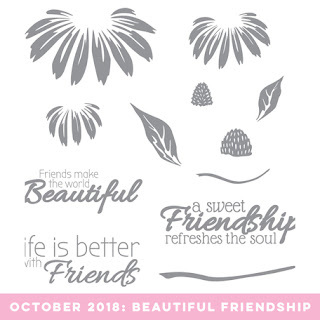 I also want to remind you to check out October's Bloom Box here which will be available for purchase from Fun Stampers Journey on October 1st, if you are not a subscriber you can purchase it ala carte while supplies last so I wouldn't wait to get yours! Today I have an awesome special to share with you with a chance to win a prize! Enjoy an incredible deal on the Journey Business Tote and Journey On Rolling Tote. Even better, 12 lucky winners will receive one of the prizes from our prize wheel inside their tote. Must be purchased August 15-September 30, 2018 to have a chance of winning a prize. The small Business/Craft Bag regular price $49.95 is on sale for just $19.95 and the tote with lots of storage and retractable handle, regular price $129.95 is on sale for just....49.95! I have both bags and I use them for crafting weekends or crops and sometime for a weekend get away. If they get dirty just take a damp cloth and wipe off. Fun Stampers Journey has randomly packed 12 of these bags with prizes! Everyone who orders one of these bags or totes has a chance to win! If you get both you have 2 chances to win with the big prize being the NEW PLATINUM SIX...two of these die cut machines will be given away! 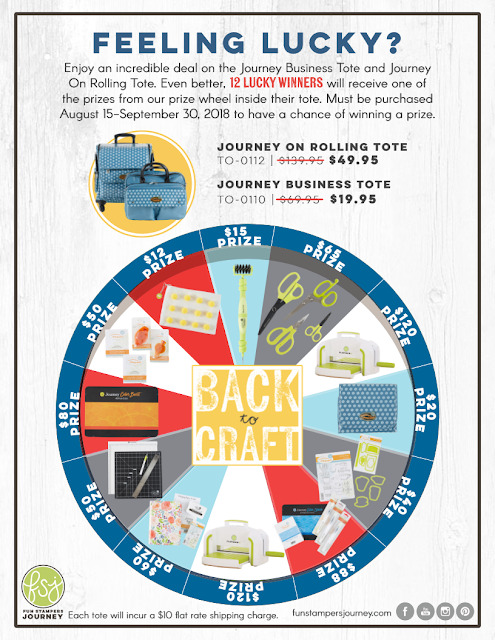 Click here for the business /craft bag or here for the rolling tote and Good Luck! What???? Can you believe it's the middle of August already with Fall right around the corner. So what does this mean for us Crafters? HOLIDAY CRAFTING of course!!! 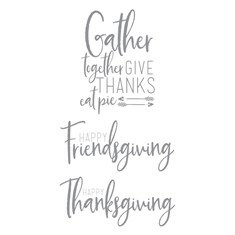 I thought I would start with a pretty Fall Card that could be used for Thanksgiving or just a simple seasonal card and change out the sentiment. Want the Card Kit FREE including directions to make this card!!! I will mail you via snail mail all the pre-cut cardstock, embellishments and printed directions. You will need a clear block and your own adhesive, inks and of course the two stamp sets featured below to complete. If you would like a detailed list of supplies including the inks I used click here to view. When you spend $35 with me I will automatically send you the kit. Both Stamp Sets are only $8.95 each! If you have any questions please contact me and I will do my best to help you. 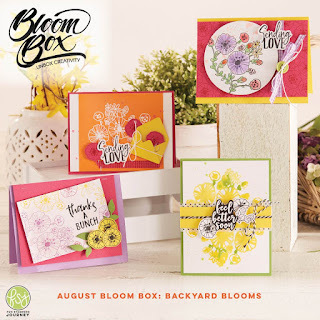 Just wanted to stop in quick to tell you to check out the Bloom Box Subscription Club... you can view all the information in the heading on top of this page labeled Bloom Box. I'm a subscriber and each month I get a Full Size Stamp Set along with all the embellishments, all pre-cut card stock and a booklet with all the directions to complete cards. You will also be able to view a video showing (how to) on techniques...which brings me to why I'm a subscriber. 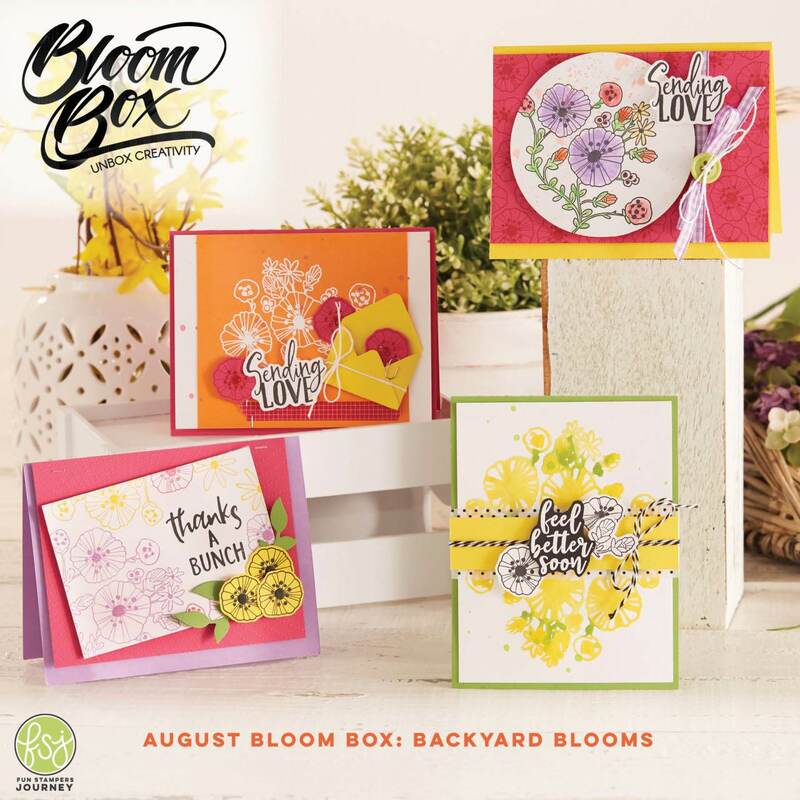 Besides receiving a Full Size Stamp Set, this month is Backyard Blooms featured in the picture above, I'm always learning something new! You also have the option of purchasing the Bloom Box ala carte for a slightly higher price if your not ready to commit to 6 months. I've never been disappointed and look forward to getting mine every month and I'm pretty sure you will too! Click here to start your subscription!